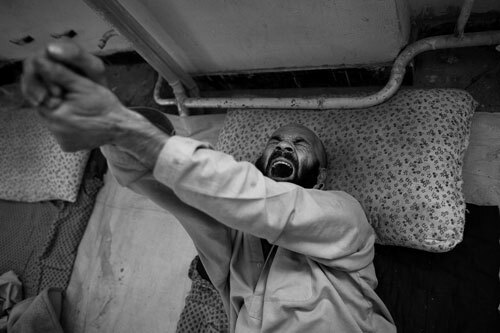 Heroin addict Ganamgul complains that his body is in pain going through withdrawal on the second day of the detox program, after 17 years of addiction at the Kabul Drug Treatment and Rehabilitation Center September 28, 2009 in Kabul, Afghanistan. Since the center opened in May 2009 it has rehabilitated over 400 addicts in it's 100 bed facility with temporary funding from International Organization of Migration (IOM) and help from the Ministry of Public Health (MoPH). The program lasts for 45 days combining both detox and rehabilitation. The center houses the 2 leading organizations that offer detox programs, Wadan and Nejat. A US Department of State report 2009 states that there are an estimated two million drug users in the country with atleast 50-60,000 drug addicts in Kabul alone.